The holidays are finally upon us! There’s no better place to celebrate them than in Tennessee’s Music City: Nashville. 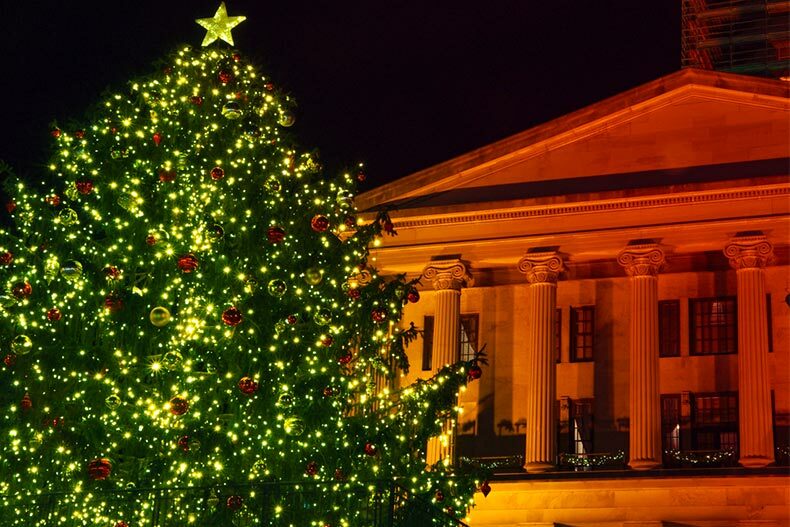 If you live in the Nashville area or are simply visiting for the holidays, there’s plenty to do for those of you looking for some holiday fun. Here’s just a taste of what’s going on for active adults looking to have a grand old time this holiday season in Nashville. The famed Opryland Hotel and Resort has been transformed into a magical holiday destination, adorned with more than three million lights inside and out. Besides admiring the beautiful Christmas decorations around the resort, A Country Christmas at Opryland offers tons of activities sure to brighten up even the biggest Grinches among us. Activities include carriage rides, snow tubing, ice skating, gingerbread decorating, and much more. Running through December 22, Jean Shepherd’s holiday favorite, A Christmas Story, is now playing at The Tennessee Performing Arts Center (TPAC). This is the tenth and final year of the performance, so don’t miss it before it’s gone for good. Tickets start at $45. The Franktown Festival of Lights is a nightly light display running through December 29 at the Williamson County Ag Expo Center in Franklin, Tennessee, just under 30 minutes from Nashville. Enjoy this festive holiday light tour from the comfort of your own vehicle, and make sure to sync your radio to listen to carefully-chosen Christmas music synchronized to the twinkling lights. Tickets range from $25 to $100, depending on the size of your car. If you like Christmas lights car tours, here’s another one for you. Through December 31, the ninth annual Dancing Lights of Christmas returns to The James E. Ward Agricultural Center. Tickets are $25 per car and the display opens nightly at 5 p.m.
On December 31, ring in the New Year and enjoy free live music from Keith Urban, Peter Frampton, Judah & the Lion, Caitlyn Smith, Devon Gilfillian, and the Fisk Jubilee Singers at Bicentennial Capitol Mall State Park. The Music City Bowl is quickly becoming a holiday tradition as the SEC takes on the ACC, or Big Ten, at Nissan Stadium on December 28. This year is a big matchup with the surprising Purdue Boilermakers taking on the historic Auburn Tigers. On December 23 at 7:30 p.m., The Oak Ridge Boys will entertain fans with their classic country hits and their favorite holiday classics. Tickets range from $30 to $90. Visit the historic Ryman Auditorium to see this holiday treat, complete with world-class ballet combined with Russian theatrical traditions including 10-foot-tall puppets, colorful, hand-painted backdrops with 3D effects, and hundreds of gorgeous costumes. Tickets range from $30 to $130.